Humankind would not have endured and cannot continue without the capacity to form rewarding, nurturing, and enduring relationships. We survive because we can love. And we can love because we can empathize — that is, stand in another’s shoes and care about what it feels like to be there. “… as long as you did what you were told you would get a good grade…” ? There is a reason psychotherapists who specialize in trauma recovery wind up talking about re-connecting with benevolence. After the shattering of what we previously believed, for the sake of restoring health, we must re-affirm our connection to goodness. Beyond the disconnection that accompanies woundedness, we belong to the greater whole. We survive because we can love. As much as I know how, I try to trust my gut on these things. And now I know with even more conviction, not only do we need this event as an opportunity to re-affirm our connection to goodness and to one another, we need to make sure the film gets completed. Your support is necessary and genuinely greatly appreciated. 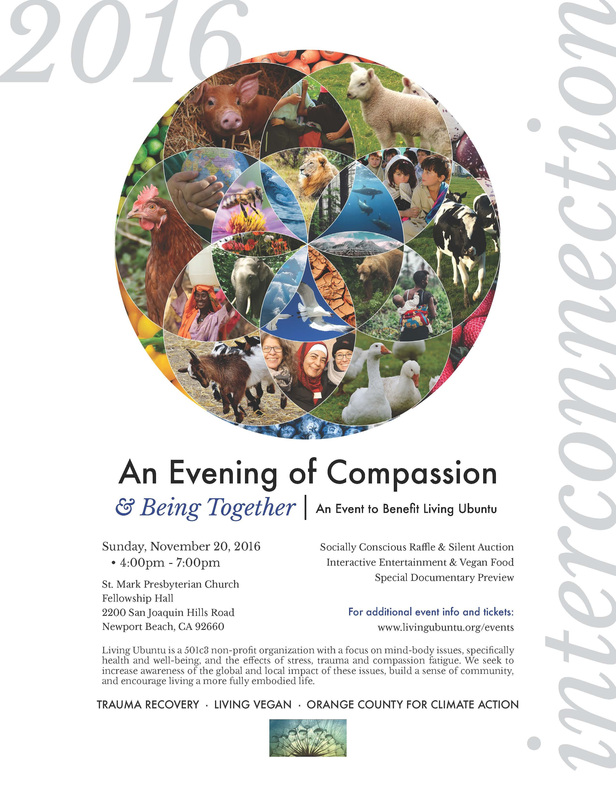 Please join us on Sunday November 20 4p-7p for An Evening of Compassion and Being Together (buy tickets / donate). And — don’t forget that this coming Saturday, November 12 10:30am we will be a Tanaka Farms in Irvine for a free cooking demo, How to Cook Vegan for the Holidays. I am really looking forward to it! See you there? 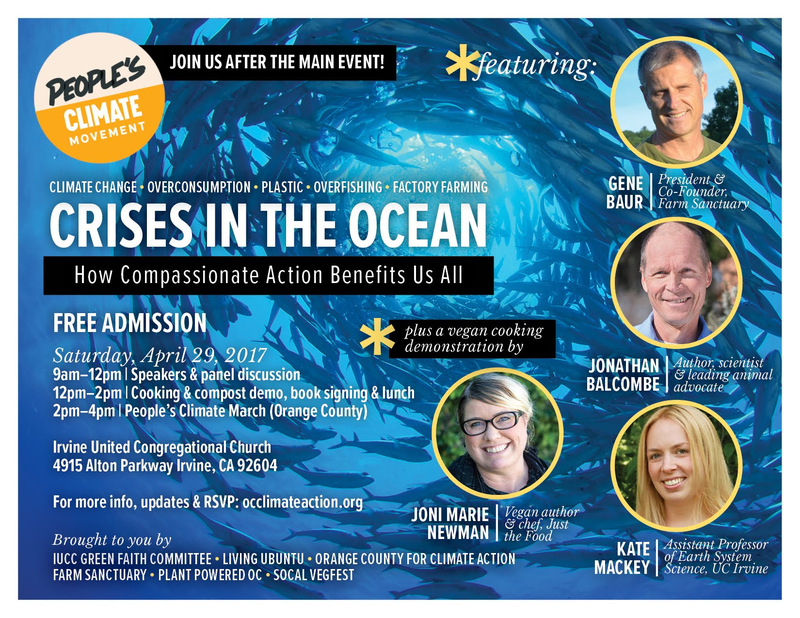 Orange County for Climate Action Meeting – note change of time, agenda and location! Orange County for Climate Action is extremely pleased to offer not just one, but two (free admission) opportunities in Irvine to hear Nicole Capretz speak in September. First of all, she herself, as a human being, is amazing. Part of her amazingness is how effective she has been in San Diego working toward clean energy. Another part is how generous with her time she has been with us. Not only did a few of us from Orange County for Climate Action recently meet with her, receiving a super-helpful tutorial on Climate Action Plans and San Diego’s remarkable success passing their recent groundbreaking clean energy law, she has agreed to give us ongoing advisement about how to accomplish similar changes in Orange County cities. Our time with her was so helpful, so educational, and so inspiring, we asked her to come up to OC so all of you could likewise meet her and learn as much from her as we got to. We want as many people as possible to hear her talk, so she agreed to come — not just once — twice! Bringing Clean Energy to Orange County, A Conversation with Nicole Capretz (RSVP) (author of San Diego’s ground-breaking climate action plan) will take place in two different locations in Irvine, both 11am-1pm, on Saturday, September 10 AND Thursday, September 15. Also — don’t forget A Screening of Peaceable Kingdom – Sunday, August 21 (RSVP). It’s a really touching, important film. I hope you will join us for that too. Next email: we are mid-way through filming a short documentary – more on that very soon!